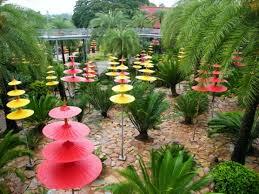 Nong Nooch Tropical Garden is a major tourist attraction in Pattaya. Although the garden is very large, it is well decorated for every part. Visitors can find different kinds of trees, and flowers, so it could be a great place to enjoy natural attraction, especially for those who are interested in gardening and different kinds of trees. Apart from the beautiful garden, visitors can enjoy Thai cultural and traditional shows and they can also enjoy elephant shows, take some photo with tigers, birds, butterflies, and so on. 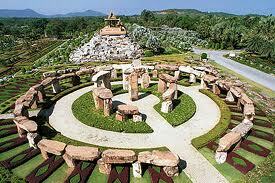 About 50 years ago, Khun Pisit and Nongnooch Tunsujja bought the territory of the current Nong Nooch Tropical Garden. At that time, this territory was a fruit garden, but after Khun Nongnooch went aboard with her friends, she was impressed with beautiful gardens seen. She then came up with the idea of gardening for tourism and change the fruit garden to a tropical garden, and she also develops facilities in the garden to support visitors at the same time. 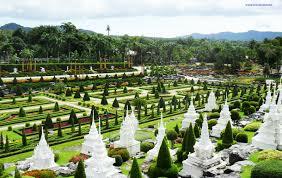 Nong Nooch Tropical Garden is beautiful due to a plenty of flowers, and palm trees. 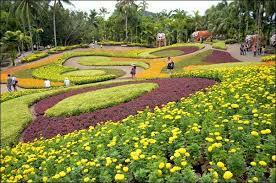 Group of flowers and trees are categorized and distributed in the area of the large garden. The same category will be placed together, bonsai trees, color pineapples, orchids, ferns, cactuses, palms, and so on. The palm garden is very interesting as it is presented with almost every kind of palm trees all over the world. There are also a variety of shows presented in Nong Nooch Garden, such as Thai traditional dance, fighting, Thai boxing, and theatre. The highlight of the show would be elephant show because a number of visitors admit that they never seen elephants acting like that before. Additionally, visitors can find a number of animals in the garden, such as deers, goats, monkeys, butterflies and so on. As other zoos, visitors can feed animals by paying for food provided. Due to different animals presented, it could be seen as a good place for visitors to take their kids to the Nong Nooch Garden. If you plan to go to Nong Nooch Tropical Garden, it will be better to visit in the morning because it is not very hot temperature, so you will have time to look around the garden. After that, you would go to enjoys animals and the shows. 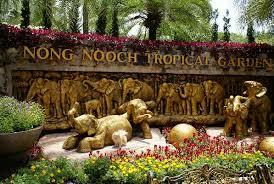 Activities of Nong Nooch Tropical Garden are always developed in order to better satisfactory of visitors, so it would still be good for visitors who visit there for the second time. 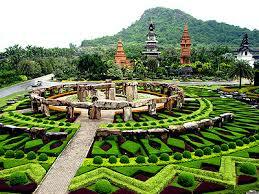 Nong Nooch Garden is about 18 kilometers from Pattaya city, so you should go there by a metered taxi or Songthaew. On the other hand, In the case that you go there by your own car, you need to drive from Sukhumvit Road to the Sattahip direction. After passing Wat Yansangwararam, you still need to go straight on for a little while and then look for a notice sign of the Nong Nooch garden. Then turn left to the garden.